When Amazon released their latest statement in their contract dispute with Hachette a couple days ago, one point they raised was that $9.99 ebooks sold more copies than $14.99 (1.74 times as many, in fact). This tied in with basic market economic theory, and it also fits with past data from Smashwords. And now I can report that the data used for the Author Earnings Report shows similar sales and pricing trends. Late Wednesday night Data Guy, the numbers person behind the AE Report, left a comment over on The Passive Voice with details. DG crunched the numbers from the July report and found that $10 ebooks not only sell more copies than $15 ebooks, the lower price point also generates a higher average revenue. As you can see in the graph below, ebooks at the $10 price point generated nearly 5 times as much revenue as those at the $15. point. As you can see in the above chart, Amazon may have been a little too conservative in their call for lower ebook prices. Not only does the $9.99 price point generate more gross revenue than the $14.99 point, cutting the price of that $10 ebook in half might just boost revenues again. The data shared by Data Guy shows that ebooks priced at $4.99 generate two thirds again the revenue of ebooks which cost $9.99. Smashwords has been making similar statements about the $2.99 and $3.99 price points for several years now, so the new info from Data Guy doesn't come as a huge surprise. But I was surprised to see that the two data sets don't quite reach the same conclusion. I wonder if the difference could be reflected in the Smashwords data not including as many traditionally published ebooks as the data set which Data Guy scraped from the Kindle Store. 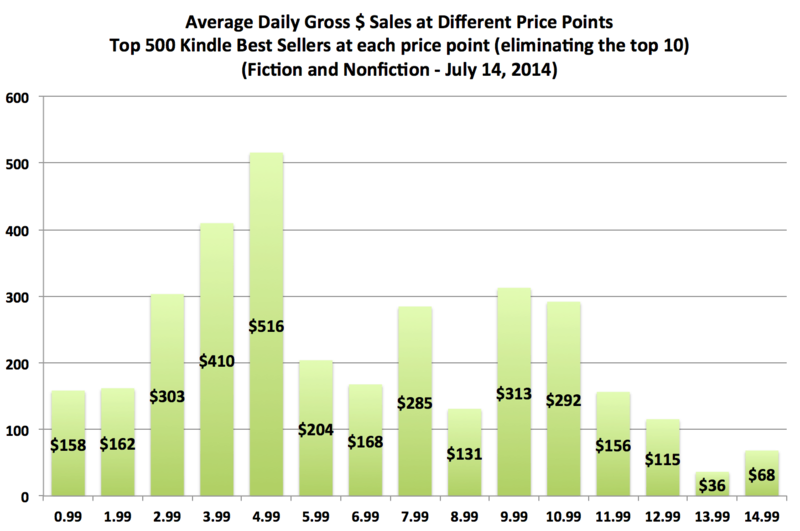 But whatever the cause, the new data confirms that lower priced ebooks generate more ebook sales. To be honest, no one has ever disputed that point, which is why there has been little disagreement with the facts of Amazon's statement of two days ago. But what Amazon has left out, and which isn't reflected in the above chart, is that ebooks are not priced and sold in a vacuum. If you entertain the notion that Amazon is just 30% of the market and that publishers have other retailers to consider — and that authors have other income streams than Amazon — then the math falls apart. Amazon’s assumptions don’t include, for example, that publishers and authors might have a legitimate reason for not wanting the gulf between eBook and physical hardcover pricing to be so large that brick and mortar retailers suffer, narrowing the number of venues into which books can sell. Killing off Amazon’s competitors is good for Amazon; there’s rather less of an argument that it’s good for anyone else. I can see where Scalzi is coming from, but I'm not sure that he's right on this point. Given that Amazon accounts for a sizable share of the US print book market, I think that they already took into account the effect lower ebook prices might have on print sales. Amazon is more than capable of making the kind of meta-analysis of how one part of the book market affects another, so I think they would know if higher ebook sales would have a positive effect on print sales. Of course, just because Amazon might come out ahead when ebooks cannibalize print sales doesn't mean that Amazon's competitors will as well (which is really the point Scalzi was trying to make). Physical bookstores don't benefit from an increase in ebook sales to the same degree as Amazon, so the corresponding drop in print sales would hurt them. But is that Amazon's problem? And more importantly, is Scalzi's point necessarily true? I'm not so sure. I am an advocate of booksellers moving online in pursuit of customers, and if you consider an indie bookseller as an online entity and not a physical bookstore then yes they could well benefit from the increase in ebook sales. But I also can't answer that with any certainty. As with everything, the actual situation with ebook prices is not only more complicated than Amazon would describe it, it's also more complicated than the naysayers and pundits might realize. With that said, I am happy to stay a low-price ebook advocate. In a WSJ quote, the Author’s Guild came clean and openly admitted that high ebook prices are meant to slow ebook adoption and to protect pbook sales. From the conspiracy lawsuit we knew that is what the establishment says privately, but the Amazon release has forced them to say it publicly. No more baloney about protecting literature or subsidizing non-fiction; it really is all about protecting their pbook and payola business model. This is a fundamental problem, it’s the root cause for all the woes publishers work themselves up over. This belief that print has or will retain some kind of primacy over digital in the long term. It won’t. They can’t stop the declines that are coming. And the argument is dangerous too. Authors have to watch accepting that you’ll get paid less on ebooks to support print because they’re not actually supporting print, they’re paying for it. Or more accurately, you are. Declining print sales are being offset by ebooks for the publisher, they’re not for the writer. I’m of the opinion your print business and digital business needs to separate. Otherwise you’ll inevitably end up short changing one to support the other and lose ground on both. That’s ok unified if you’re focus is principally one or the other but if you’re trying to pull max returns on both in a coordinated effort, you’re in trouble. I watched this same thing happen to newspapers, trying to balance print and digital with a print-first ethic and a vague idea of some kind of orderly transition to digital somewhere in the distant future if ever. Then the transition got rolling and kicked them in the teeth. Trying to restrict digital to support print is a dangerous game. And that’s probably why they touted the $9.99 price point instead of the (on the surface) more profitable $4.99. Odds are they figure the cannibalism of the sales of other products (ie, paper books) wouldn’t be made up by the increased profits of lower price points on ebooks. I’ve been looking at these data and am not convinced that the analysis proves much. As a statistical data set it’s profoundly corrupted by selection bias, and I can’t see much that the econometrician can do to get around it. A closely related problem is that it’s a segmented market, with what are probably widely varying elasticities among segments, and the data set mashes all of the segments together. As for the future, it lies with electronic books. The economics of book production and distribution guarantee it. When Mr. Gutenberg came out with movable type the producers of “real” books, manuscript books, scoffed. Cheap print books might be OK for the unwashed, but serious book buyers would want the high-quality hand-made product. It took about 50 years for copyists to disappear altogether, but disappear they did. POD ensures that there will always be an option for print books at less-than astronomical production costs, but as new readers come along the print market will dwindle. Trying to defend the print market is to try to hold back the tide. I don’t think it is any surprise that the lower priced books sell more and eventually make more. Indies which are normally lower priced have been growing by leaps and bounds and more than a few making enough to make a living. I kept seeing the bestselling authors yelling from their Hachette bandwagon that the price need to be high that people are willing to pay for the latest releases. But these authors are bestseller and most of them have been around 5,10, 15 years. Their fan base started before ereader/tablets were under the $100 and affordable. I have to wonder if they got their wish with agency pricing about the newer authors, the debut ones. Are people really willing to pay those high prices for an unknown, especially when there are tons of priced under that $12 mark? I can’t help but think as time goes on the brick and mortar stores and print books are going to be less relevant. Just like music stores and cds have become. There still is a demand but it is a lot smaller. If I want an ebook I’m not going to go to my local book store just because the price is lower for the print version. More than likely I’m going to find another book to read that is in my price range. While I believe Amazon’s latest statement was correct in arguing that a key detail of the dispute is the price point, I believe they are really much more concerned about the issues of anti-competive price fixing. It’s been rumored (and we don’t know for sure) that this started because Hachette simply refused to negotiate a new deal with Amazon after their old one ended. Amazon then retaliated by cutting discounting, pre-buys and pre-orders. If this is true, it makes sense that Hachette might have felt justified in saying they were being targeted and trying to get their writers worked up about the injustice. On the other hand, it’s reasonable that Amazon felt they had no obligation to give Hachette their historic financial perks if there was no contract. But I believe what both sides haven’t been up front about is the fact that they both know Hachette and the other big publishers are gearing up for a big fight about the agency model. It has been rumored that because the DOJ settlement requires the publishers to negotiate their deals with Amazon in separate time periods, and Hachette was first, Hachette wanted to delay a new deal until it could align it’s interests with the other publishers. In other words, instead of illegally conspiring with other publishers to force the agency model on Amazon, it would legally collude with them. Amazon, not wanting to give Hachette a free ride as it planned its attack, jumped in first by cutting pre-orders, etc. If, and it’s a big if, this is going on, the issue of price is probably secondary to Amazon. The bigger issue is price fixing. If Amazon is not allowed to discount books, that will really empower its competitors, like Apple and Google books. That was at the core of the DOJ lawsuit. So this is price fixing part 2. Naturally, complaining about the downsides of price fixing is a more complicated argument, and one that is more about Amazon and less about readers and self-publishers. So it makes sense Amazon focused their statement on high prices. This econometric analysis shows that 28 % of the e-book sales on Amazon comes from cannibalizing print books, while the other 72 % comes from market expansion. So Amazon loses on the lower sales of print books, but gains on the sheer number of e-books sold. The data is … wrong. To simplify it , they’re just grouping every book as if they’re interchangeable. http://authorearnings.com/ apparently belongs to http://outthinkgroup.com/, which all it really is, an advertising platform for Tim Grahl’s book The Step-By-Step Guide to Marketing Your Book, available from Amazon only. I quite frankly don’t see anything wrong with the publisher or author being able to set the price of the book to what they want it to be. They are the ones taking the risk over sales. I do have problems with Amazon declaring that they set the price for everyone which once again is the argument that everyone is forgetting. As a businessperson, I do agree that the publisher should have a strong say in the sale price. As you said, it is the publisher’s risk (if the price is uncompetitive). My say on this is that Amazon should argue they should not be given a wholesale price higher than their competitors. They should get at least the same wholesale price or maybe lower if they are their best retailers. Finally, Amazon should also have the right to price match any of its competitors. Knowing Amazon, they can still throw freebies in like free delivery to outdo the competition. It would be unfair on Amazon if companies such as Apple and B&N were allowed to discount their prices while Amazon was forced to remain their prices higher. This is exactly what the publishers are quite happy to agree to: same wholesale price everywhere. I don’t buy the comparison with a Porsche 911. There is a huge element to the cost of these cars that comes down to exclusivity. Ferrari and other high end brands only put out a limited number of these vehicles and price them as limited editions. Their sale price does not always reflect the cost of making the product but what some people are willing to pay. This is exactly correct Paul. It’s none of Amazon’s business what publishers want to sell their product for. People will either buy it or they won’t. Costco and SAM’s don’t dictate a price to publishers, nor does WalMart or Target. That’s because the retailer gets the final say on prices in those cases. They pay the publisher’s price (wholesale) and then prices the book how they want (generally MSRP -25% to -40%). The publishers have no say in the final price beyond simply not selling to the retailer. There is no reason for it to be different when it comes to ebooks. It is absolutely none of the publishers’ business what the retailer sells them for, beyond having the option to not sell to that retailer. I am a reader, a voracious one. For me, the Kindle was the greatest invention ever! Just imagine, I could carry thousands of books with me wherever I went, a reader’s dream. My first Kindle was a gift from my husband who also loved the idea of stopping the endless piles of physical books. And it worked rather well. I’ve only purchased a handful of physical books in the 4 years I’ve had Kindles and those were really just to have an autographed copy since I also have the ebooks. When I first got my Kindle, I continued my previous book buying habits, getting a bunch of “paperback” books that were new each month, and just a couple ‘hardbacks’, but in ebook version. Then along came the agency model a few months later. I was pretty outraged. Why could grocery stores discount physical books but Amazon could no longer discount ebooks? Why should I pay $7.99 for an ebook when the paperback was $5.99? I then discovered backlist and indie ebooks. Books for $2.99 or less? I was there! Not to mention all the freebies! And that’s where my book buying habit is still. I rarely spend more than $2.99 for a book and then only for a favorite author and usually not more than $6. I have close to 15,000 ebooks in my account, more than I can read in a lifetime. I also check out ebooks from our library, more books I won’t have to buy. As for the $9.99 price point, why to book publishers think that Econ 101 doesn’t apply to them? It’s basic knowledge that you will sell more widgets at a lower price than a higher one. They aren’t protecting print sales by doing it either, since I’m sure there are a lot of readers like me who don’t care about print anymore. I’ve been a lifelong library lover. I worked in libraries both as a kid and as an adult, I love the printed word. But that nostalgia doesn’t mean that I don’t love my Kindle full of ebooks more, not to mention the convenience of getting a book almost instantly, instead of driving to the store, or waiting for the mail. I love checking out ebooks from the library from home and having them return automatically. Amazingly cool! Bottom line, the publishers brought this on themselves. If they had continued with the traditional retail model, most readers would have been happy paying similar prices as the physical books as they had been doing for years. I side with Amazon. They put the customer first and have done more for me as a reader and a customer than any other business – ever. Book publishers don’t even consider readers their customers, bookstores are their customers. Well they lost me a long time ago by playing their games. But thanks for the huge credit I received from the case settlement, I happily spent it, $.99 and $2.99 at a time. That’s a lot of ebooks for $157.68! It wasn’t too long ago another large web-based company started disrupting a legacy product. Apple’s 99-cent MP3 enabled consumers to save money while getting the content they wanted. With fewer people buying CD’s at the ghastly $18 a pop, the record industry has only recovered in some small fashion by pumping more money into marketing concerts, merch, and the occasional vinyl album. When was the last time you heard about a CD release party, though? Or bought an easily-scratched piece of hardware with an equally fragile (and hilariously named) ‘jewel’ case? My point here is that legacy content producers have, are, and ought to go the way of the dinosaur if they can’t evolve with the times. There is no reason to charge the same price for a hardcover (or CD) when the e-book (or MP3 single) is all people want. You’re not comparing like with like though. Your model is only accurate if people wanted to buy individual chapters and not the whole book for 99 cents. The actual cost most people buy albums at hasn’t changed that much at all.